For anyone who might want to have a side conversation...you're welcome here! 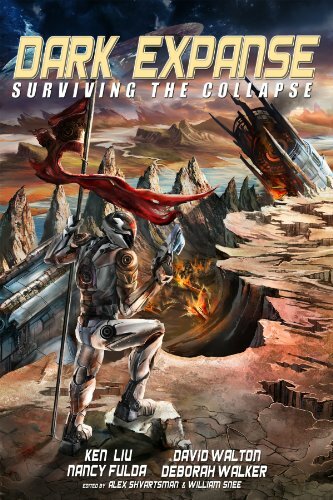 To celebrate the launch of the fourteenth Black Eye galaxy, Deorc Enterprise will be giving away free copies of Surviving the Collapse. Now through Feb 26th, grab one and enjoy this collection of stories by award winning authors. If only we could get David to write us a nice short story. Seems you can only get to it through a 'free Kindle trial' wall. Which I'm sure entails considerable inconvenience to prevent it from becoming not-so-free. 'Kindle' is a synonym for 'set on fire'. Kind of an ironic name for a book reader, ain't it? Imaginos1892 wrote: Seems you can only get to it through a 'free Kindle trial' wall. Which I'm sure entails considerable inconvenience to prevent it from becoming not-so-free. So free book with purchase of $200 e-reader? Whatta deal! The imagination has to be trained into foresight and empathy. You can get a free kindle app for your phone or tablet. Just don't ask what is in the protein bars. Lord Skimper wrote: You can get a free kindle app for your phone or tablet. Ok, good now I need to buy a tablet? The wife has one and she hates it, and reading almost anything on my phone? fuggeddaboudid. pappilon wrote: Ok, good now I need to buy a tablet? The wife has one and she hates it, and reading almost anything on my phone? fuggeddaboudid. 3. There's also readers for your desktop/laptop. Do I actually sit at a desk to read books? Yes, yes I do.